Katie's Blog: New Month, New Year, New Challenges! Happy New Year! I hope you celebrated the new year just the way you wanted! I did, which meant normal time in bed and up the next morning as usual. We have discovered that our sleep routine is much more important than staying up to see the clock tick past midnight. Along with a new year we have a new month and hence loads of new challenges. I have a few pages to share for some of the great challenges out there, but I won't overload you with them all in one post (not to mention confuse myself too, it doesn't take much these days!). 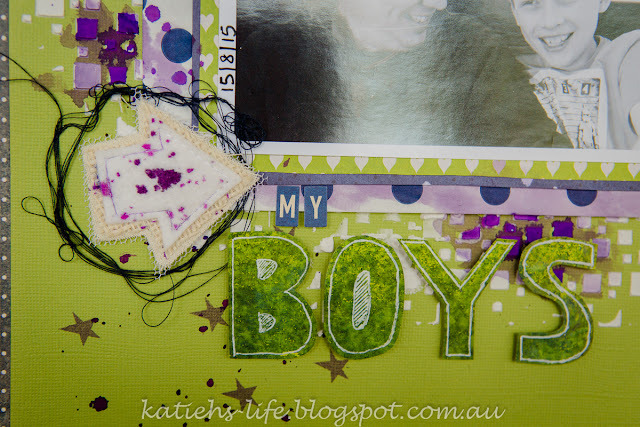 I am going to start with Scrap the Boys, as this is my last month on the creative team. It has been a great team to be on and I will continue to *try* and do the challenges. I am looking forward to seeing who will take over the reigns. This month is an inspiration board with a great mix of colours, but not ones you might automatically reach for on a boys page. I loved using some Flutterby Designs flair (perfect place for boy themed flair if you are looking!) and one of their cool stencils. 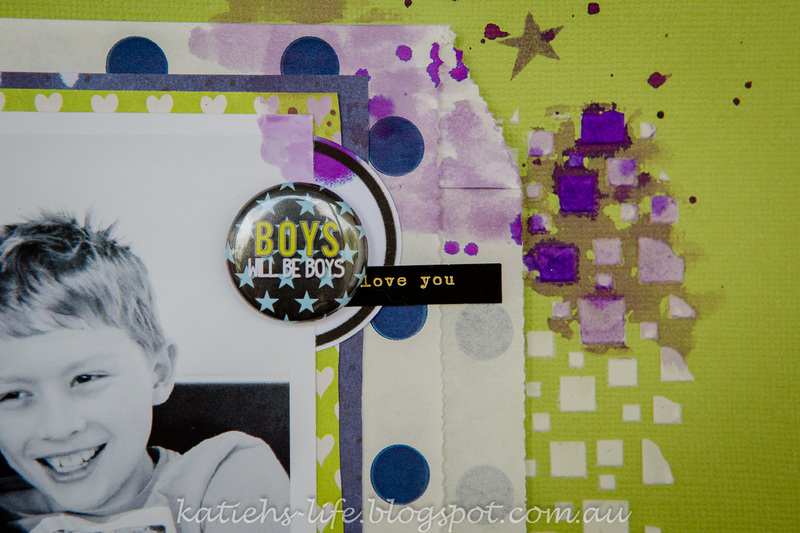 Still loving the DIY Charms Creations, this time an arrow with a splattering of purple. I misted some different greens on cardstock (actually a failed first attempt at an idea for this page!) and then drew my title and cut it out. White gel pen helps make it pop on the green background. Here is a cloe up of that cool boy flair I was talking about, and you can see the pattern from the stencil too. I hope you go and check out the rest of the team's inspiration and maybe have a go at this challenge too. 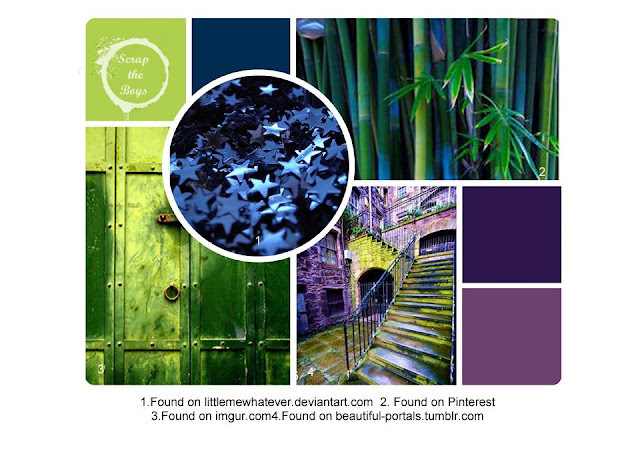 You might just find you love these colours together just as I did!